Dry ice: 20-50 lbs. While you can do the job with 10-20 lbs, the more you have the quicker it'll go. It's worth the extra money. I used 40 lbs. Hammer: ball peen is the way to go. A heavy dead blow hammer was also particularly effective. Thick gloves: dry ice will give you frostbite and a chemical burn if you handle it with unprotected skin. Be careful and don't let it ruin your day. Step 1: use your razor knife to score lines in the tar. Make sure to press hard as to cut as far thru the tar as possible - this makes life easier later. Cut lines horizontal then vertical across creating squares. The smaller the better - but still a decent size piece maybe 3x3 or so. Go ahead and cut all the tar in your car now and be done with it. Step 2: take 10 lbs or so of your dry ice and put it in your bag and seal it up. Use your hammer to break it into small bits - think the size of refrigerator ice cubes or a little bigger. You can use the solid slabs of ice, but they aren't as effective on curved areas like trans tunnel. Step 3: place your bag on the tar. Work dry ice bits out evenly over the area. Step 4: Let sit for 25-30 minutes. Use this time to walk the dog, enjoy The weather, work on another part of your project, or something else that's awesome. PRO TIP: nestle a few bottles of your favorite beverage on the ice and come back to ice cold goodness. Step 6: once all the big pieces are up use your razor scraper to remove what's left over. I've heard WD-40 helps at this stage but didn't try it myself. Of course, if the colder the better. Voila! You're done! 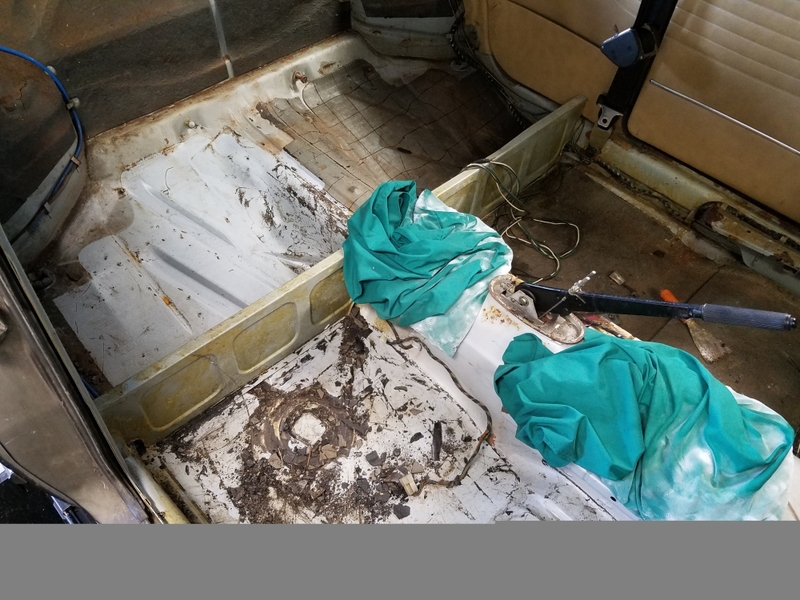 Now clean up the rust that you've uncovered with a abrasive wheel and POR-15 and recover with your choice of sound deadening and carpet! Please take note that dry ice removes oxygen from the air. If you are going to be working with dry ice for any prolonged period of time; make sure you work in a well ventilated area! 1) I used pillow cases. Perfect. 2) It doesn't take 1/2 hour; more like 10-15 minutes, per section. Don't be shy with the hammer. 3) You don't need to cut all the way through with your razor knife to prep. Just scoring it criss cross is fine. 4) The tunnel is the toughest part because of draping the pillow cases and smacking it with a hammer. I'd give these areas a little more time. 5) I didn't do the rear seat back part. It was in perfect shape, so I'm leaving it alone. 7) Have some paint thinner to clean up afterwards. Tar is messy. Good luck! Took me about 5 hours..